TinTrunk was established by Sarah, a recovering collector and design historian, in 2009 and is based in a leafy Victorian suburb near the city of Manchester, England. Initially the stock was drawn entirely from her extensive collections, accumulated over many years of enthusiastic hoarding. And there's still more layers of accumulation to mine . . . Anyway, the realisation dawned that having lots of stuff hidden away in boxes, suitcases and (yes!) tin trunks was rather ridiculous and it was decided that these hidden treasures should be found new homes. 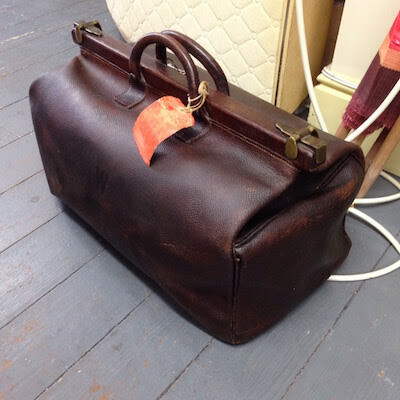 TinTrunk can be found at 20th Century Stores, 26-27 Market Place, Stockport SK1 1EZ. Tuesdays, Fridays and Saturdays from 10.00 am to 5.00 pm. Thursdays 10.00am to 4.00pm. And also on the second Sunday of every month for the Vintage Village fair, held at the nearby Covered Market Hall. 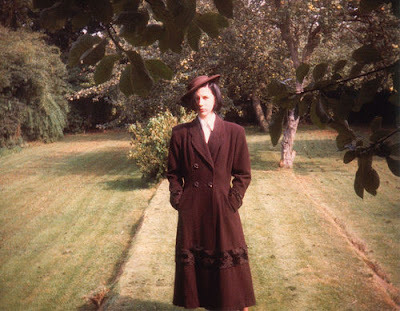 Your proprietor in her teens wearing a (slightly too large) 1940s coat and hat, sometime in 1981.